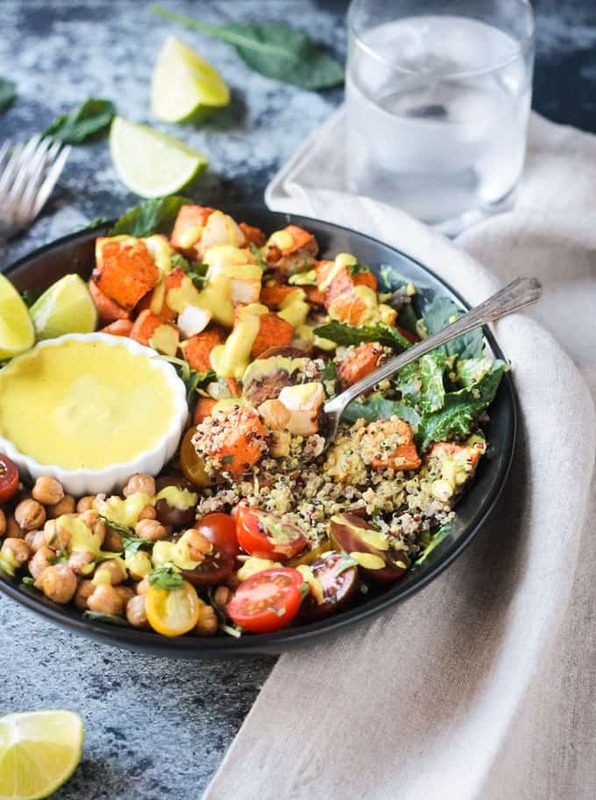 Sweet Potato Quinoa Bowl – Roasted vegetables, healthy plant protein, lots of texture, bursts of fresh flavor, and a creamy Cashew Curry Sauce to bring it all together. A delicious fall meal suitable for any night of the week. 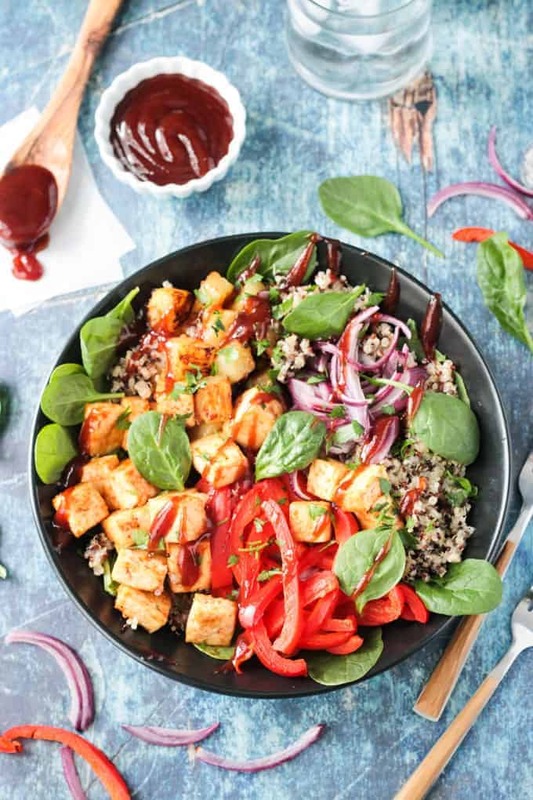 This Sweet Potato Quinoa Bowl has sweet, heat, spice, texture, flavor, and nutrients galore! The cashew curry sauce is mild enough that even my kids like it. The whole bowl comes together in less than 45 minutes, making it perfect for any night of the week. 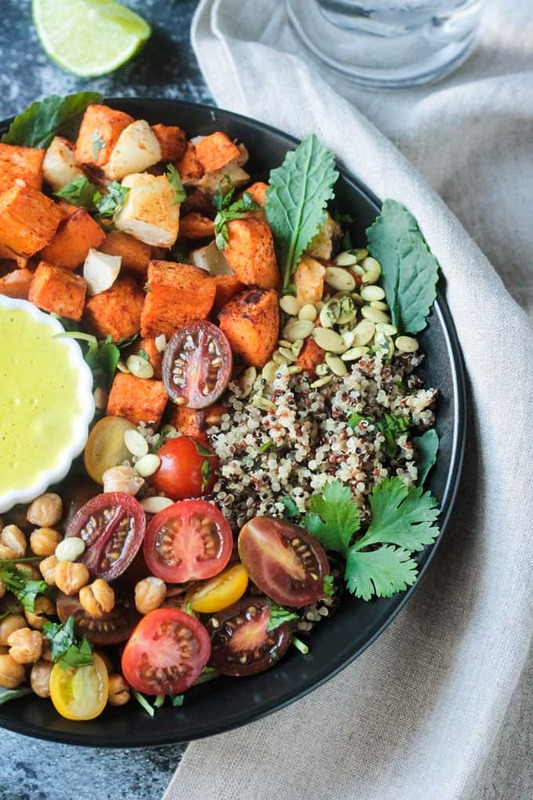 This bowl is loaded with healthy foods! I love sweet potatoes and apples together. The combo is sweet with a little hint of tart and reminds me all things fall. I added some chili powder, smoked paprika, and cinnamon to spice up the natural flavors of the fruit and veggies. Butternut squash would work in place of the sweet potatoes if you prefer. You could also sub in rice or couscous for the quinoa. Feel free to make it your own with your favorite mix of grains and vegetables. But don’t forget the dreamy Curry Sauce! This Cashew Curry Sauce is my new best friend. I’ve been using it on everything! 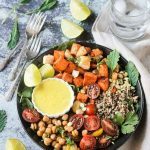 From dunking roasted potatoes in it to drizzling it on simple green salads to slathering it on sandwich bread to, of course, dolloping it on all sorts of veggie and grain combos, buddha bowl style! It’s super easy to make, coming together quickly in a high speed blender. As always with bowls like this, I like to start with a handful of greens. Not only do they make the bowl presentation look pretty, but they are super healthy. Mixed with all of the other flavors and textures, even you leafy green veggie haters out there may find you tolerate a leaf or two. Adding the warm sweet potatoes, quinoa, and chickpeas right over the greens starts to wilt them down just ever so slightly making them easier to eat without being at all mushy or slimy. 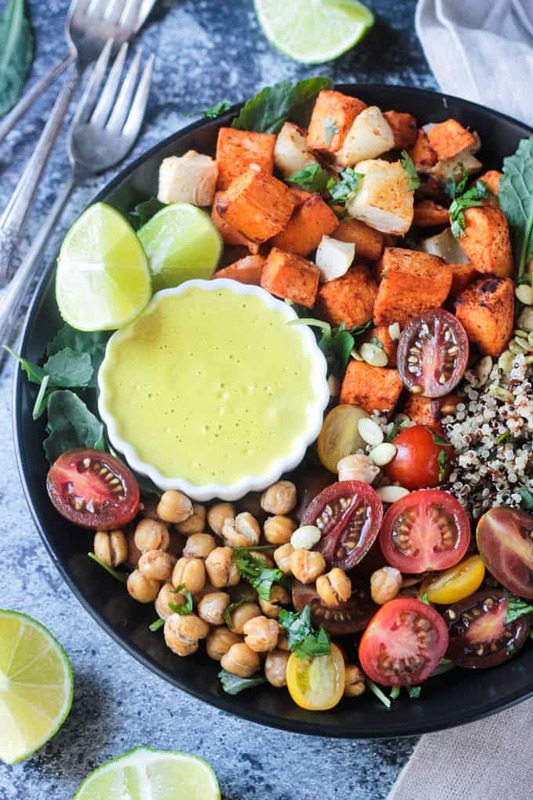 I hope you love this Sweet Potato Quinoa Bowl w/ Cashew Curry Sauce as much as we do. Please leave me a comment below with your feedback and star rating if you try it. 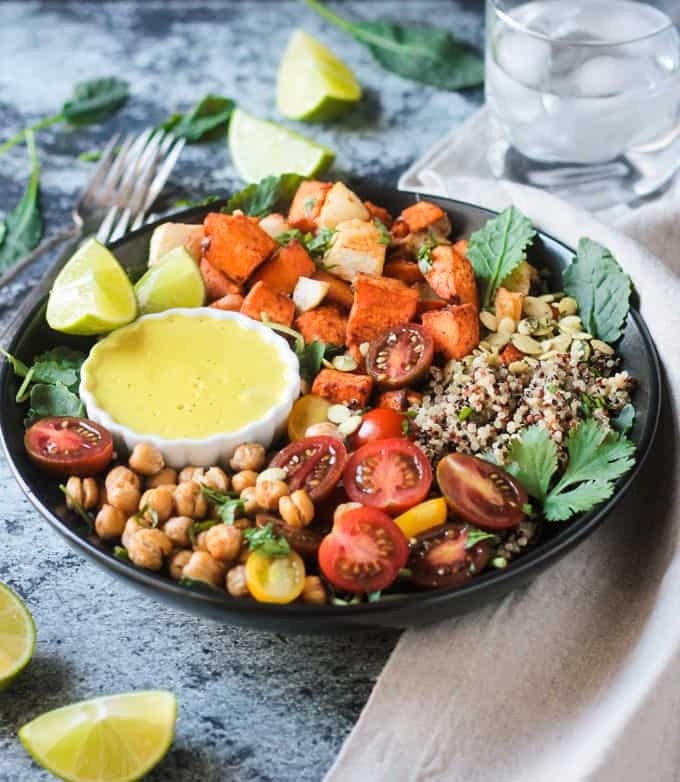 Sweet Potato Quinoa Bowl - Roasted vegetables, healthy plant protein, lots of texture, bursts of fresh flavor, and a creamy Cashew Curry Sauce to bring it all together. A delicious fall meal suitable for any night of the week. Preheat the oven to 375 degrees F. Line 2 rimmed baking sheets with parchment paper and set aside. In a medium mixing bowl, toss together the chopped sweet potatoes, apples, 1 tsp oil, smoked paprika, chili powder, and ground cinnamon. Make sure the seasonings are evenly distributed over the potatoes and apples. Pour onto one of the baking sheets and spread out into one even layer. In the same mixing bowl, toss the drained chickpeas with 1 tsp oil, garlic powder, and cumin. Spread out onto the other baking sheet in one even layer. Place both baking sheets into the preheated oven for 15 minutes. Toss, turn the pans around and switch their position in the oven to ensure even baking throughout. Bake another 10-15 minutes until tender and starting to caramelize on the edges. While the potatoes, apples, and chickpeas are baking, start the quinoa. Combine the quinoa and water or broth in a sauce pot. Bring to a boil, lower heat, and simmer for 12-15 minutes until tender and the water is absorbed. Once the quinoa is cooking, start the sauce. Place all ingredients for the sauce into a high speed blender and purée until smooth. Add additional water 1 tablespoon at a time to thin out, if needed, to your desired consistency. Taste and adjust seasoning, adding a little more heat with a dash or two of sriracha, if desired. 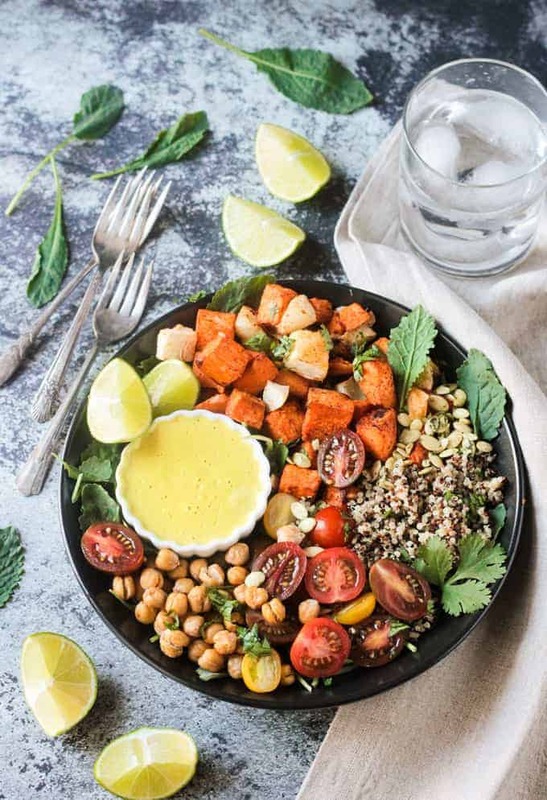 To assemble the bowls - place a big handful of baby greens in the bottom of each bowl and top with quinoa, sweet potatoes and apples, roasted chickpeas, and any garnishes you're using, like halved grape tomatoes, shelled pumpkin seeds, fresh chopped cilantro. Drizzle everything with the Cashew Curry Sauce...as much or as little as you like. I use about 1/4 cup per bowl - you'll have some leftover sauce. ~ This recipe might seem like it has a lot of components, but they are all easy and if you time it right, they all come together in just 35-40 minutes. ~ Nutrition facts calculated without garnishes or sauce since amounts can vary.